I am travelling in the land down under with aerialist and clown Miss Heather Lewis. Our travels are taking us from Sydney to Brisbane and back along the Pacific Highway 1. It is winter now in the Southern Hemisphere and the weather has been overall sunny with patches of rain. The people here have been very friendly and accommodating, most locations we visit are suited to international backpackers. We arrived in Sydney during the Vivid! Festival. The highlight of the festival was a show called “Rocks, Fire, Water,” featuring multi-media, fire performers, aboriginal dancing, puppets, and aerialists hanging from a glowing pirate ship. From Sydney we began our travels north, stopping first in Port Macquarie, a quaint little town by the coast. 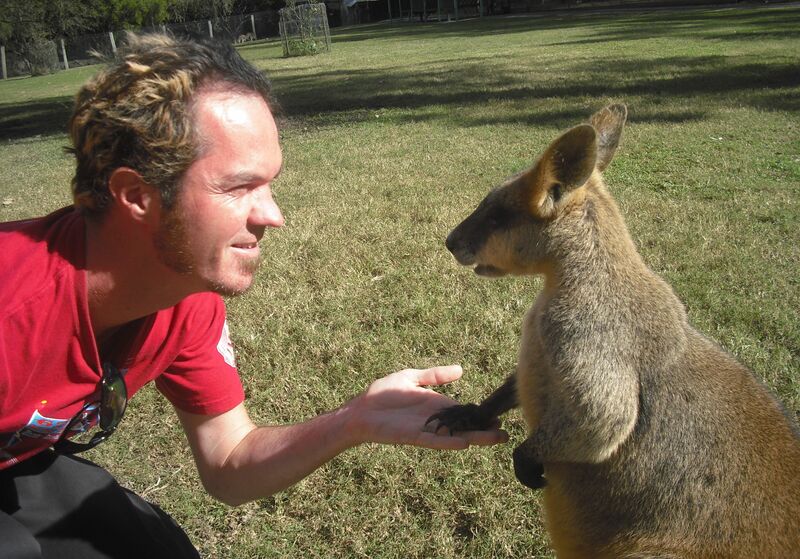 Nearby were the Billabong Koala Wildlife Park and a Koala Hospital where we learned all about these curious little creatures native to Australia. At Byron Bay we stayed at the Arts Factory Lodge Hostel, with a down to earth, hippy-friendly atmosphere that would make any Arcatan feel right at home. We finally arrived in Brisbane, some 1,000 kilometers from Sydney, where the highlight was a metropolitan ferry ride to a public park for a barby, complete with kangaroo meat, a soccer match, and a juggling show. Following the American Revolution against England, Britain was overpopulated by soldiers. With little opportunity for work, many people turned to crime to provide for their families. In response to the overwhelming number of convicts, British government sent the convicts to Australia with other colonists. Australia’s population is made up of descendants of convicts and colonists, Indian settlers, a small minority of aborigines who, with a tragic past much like that of the natives of North America, reside in reservations in the outback, so we were told. Australia has a great art scene, aside from the Vivid! Festival, we also saw a cabaret performance as a part of a fringe festival on the Gold Coast. We stopped at Circus Arts!, a school and training facility that contained all our favorite toys. It was a large warehouse, complete with flying trapeze and other circus equipment. 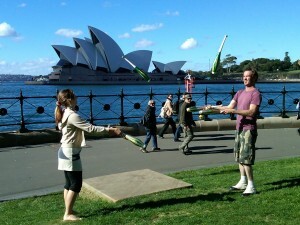 Miss Heather Lewis and Shea Freelove juggling in Sydney. Our travels have been peppered with street shows, spontaneous workshops, and other interactive performances, all met with smiles and positive response. This entry was posted on Tuesday, July 6th, 2010 at 10:19 am	and is filed under Community, Scene. You can follow any responses to this entry through the RSS 2.0 feed.